This entry was posted in Uncategorized on July 31, 2015 by Rowena. 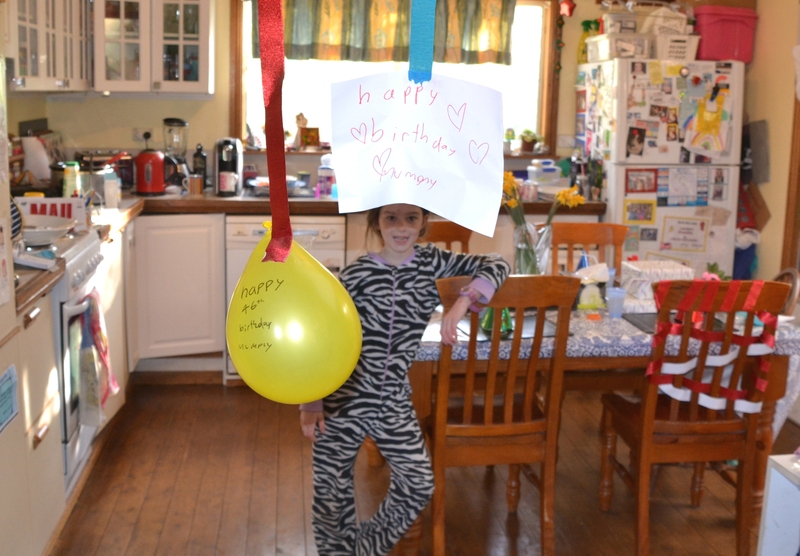 My daughter went to so much trouble for my birthday this morning making cards, hanging up streamers. The kitchen looked beautiful and she had gone to so much trouble! Miss did a fantastic job decorating the kitchen. She became quite overwhelmed by this sense that I was going to be lonely spending the day without the family. Feeling almost consumed by this sense of my abject loneliness, she wanted to stay home from school and spend my birthday with me. These were beautiful sentiments but there was just one problem. I’d arranged to go out to lunch with my friends. 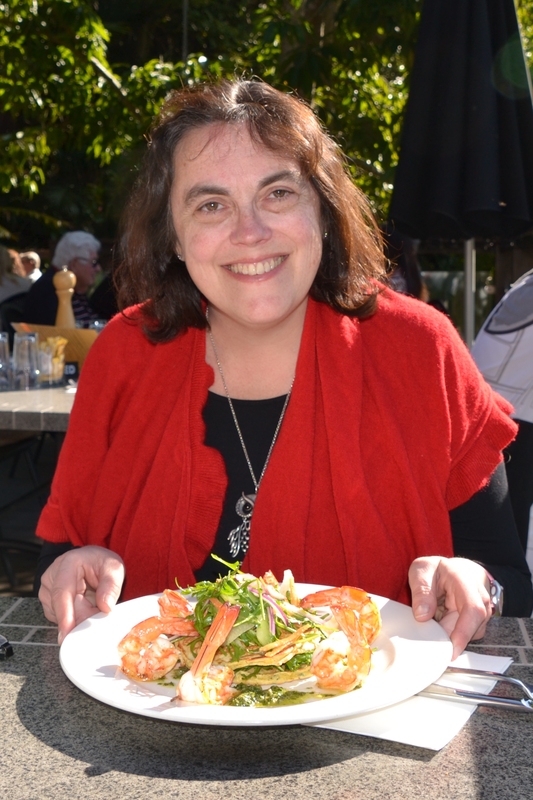 We’ve struggled to get together this year and I think this might be the first time the four of us have managed to get together so it was pretty special and we’d booked into a cafe set among towering gum trees, a contemplative fish pond with intriguing carp and scrumptious food. 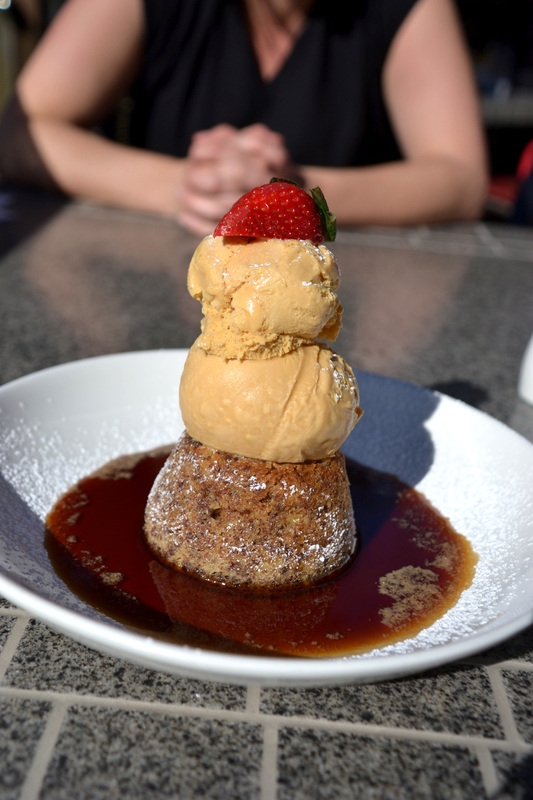 I can’t exactly remember what it was…banana pudding with caramel and toffee ice cream. I was feeling very indulent and even though I’ve had a big tummy ache for the rest of the day, there are no regrets! 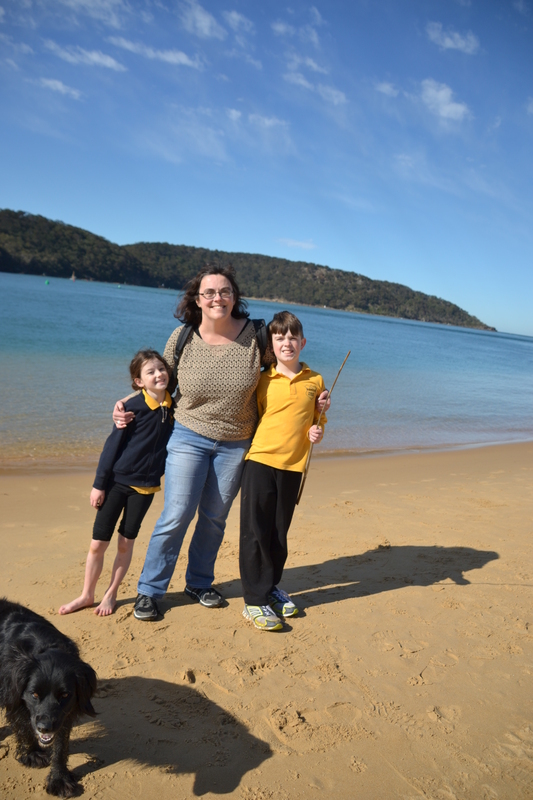 Mummy had plans and …awkward moment…they didn’t involved my daughter tagging along. After much debate, tempers and tears we compromised and I took the kids and the dogs for a walk along the beach. I often talk to them about the various dogs and humans I meet down at the beach and so it was great to be able to share this world with them and I knew they’d have fun. 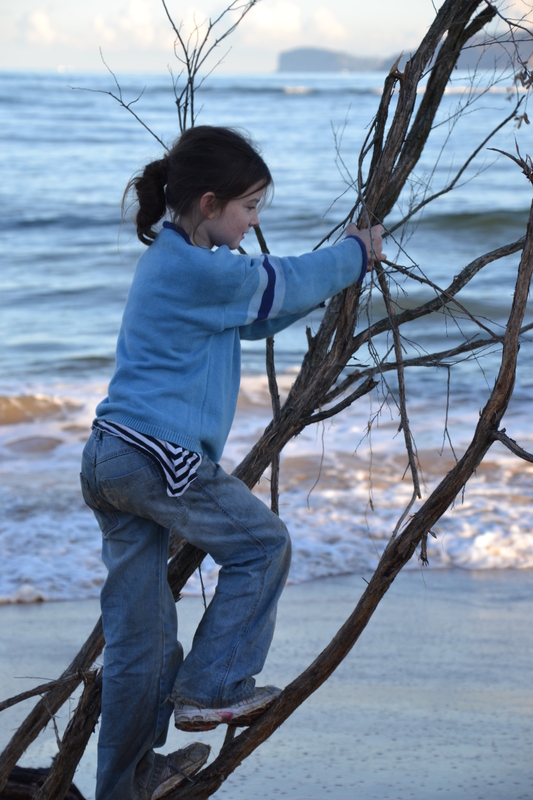 While detouring to the beach on the way to school might seem a bit naughty, my daughter’s emotions have been quite fraught lately and I felt she needed that together time. Moreover, despite being the middle of Winter with bitterly cold nights, the sun was out and it’s an almost balmy 16 degrees Celsius. It’s absolutely beautiful. So, off we went kids and dogs in tow. Bilbo was in his usual fine form ingratiating himself to other dog owners throwing balls and he has trained the humans to throw the ball for him as well. Bilbo training another dog’s Dad to throw the ball. When it comes to tennis balls, Bilbo is totally obsessed and the epitomy of a working dog. Every ounce of his concentration is fixated on that ball. One paw raise, ears cocked, he has absolute tunnel vision and sees nothing else. His entire world is a green sphere and even though we were leaving to go home today, he was still staring at that ball. Fortunately, once I mentioned “car” miraculously the spell was broken and he finally came. The kids found this huge “stick” and Spitz was lucky not to catch it! Meanwhile, the kids enjoyed climbing over fallen branches and throwing our mate Spitz a tree trunk of a stick. Spitz was very obliging and did give it a bit of a chew and inspection but that hefty lump of wood wasn’t going anywhere. I sometimes forget that my dog walking world at the beach has become my own private bubble inhabited by characters which the rest of the family have never met. I am there most weekdays just after school drop off and I meet virtually the same humans and dogs down there everyday and have become a part of that community…that world. Having down the tough love, terrible mother thing and dropped the kids at school, I am about to head out to lunch. I am even going to wear lipstick so this is what I consider formal. Meanwhile, I bought myself two bunches of fresh daffodils. My grandfather and I almost share a birthday and he once bought me a daffodil in a pot for my birthday. From my response, you’d think he did it every year but daffodils always remind me of him. 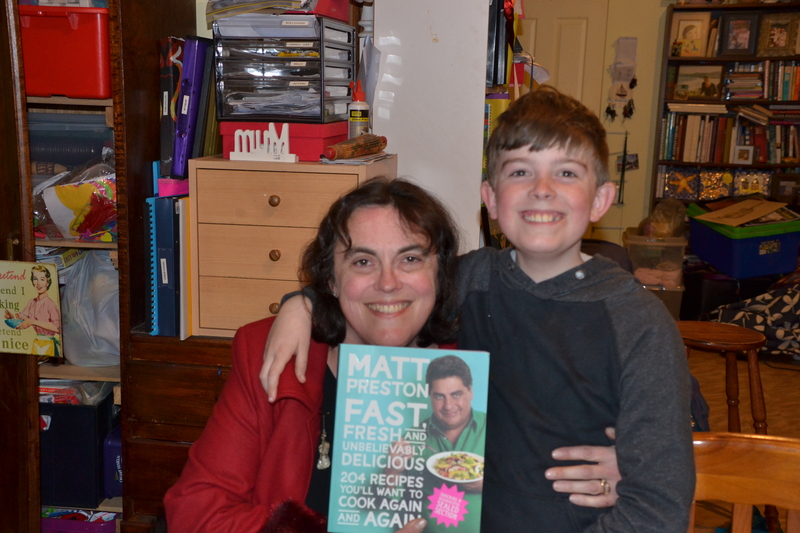 Mister gave me a fabulous cookbook by Masterchef, Matt Preston. I am wondering whether I now need to buy some loud outfits to reproduce the recipes! So my birthday continues. My husband wished sleeping beauty Happy Birthday as he left this morning. My present is on the kitchen table but I’ll wait til he gets home tonight. It’s nice to know he remembered. I almost forgot myself things have been that chaotic and over the last few years, my birthdays have lost the pomp and ceremony they used to have. I feel like a broken down jalopy who just seems to make it to the finish line each year and don’t quite have the zest and enthusiasm leftover for any rah rah! Just making sure they still love me when I’m 64. My husband gave me this gorgeous platter designed by David Hart, son of artist Pro Hart. 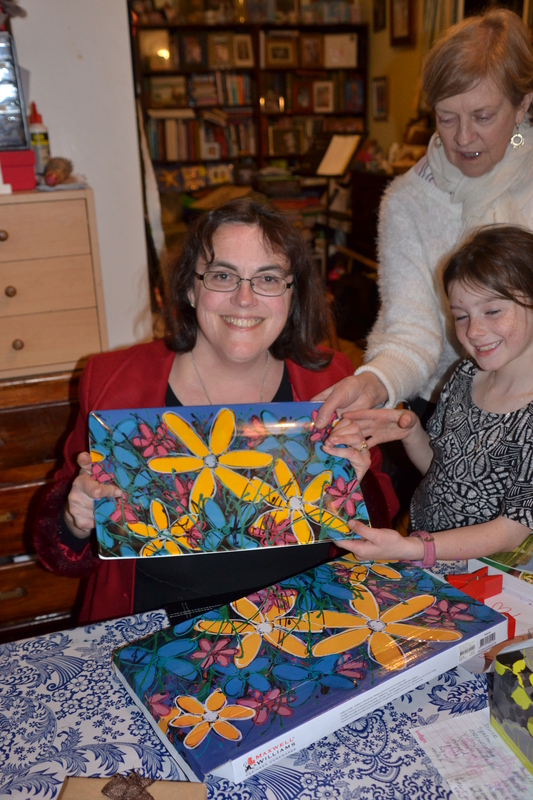 Such a thoughtful gift and I just love those bright yellow flowers! So very Rowie! 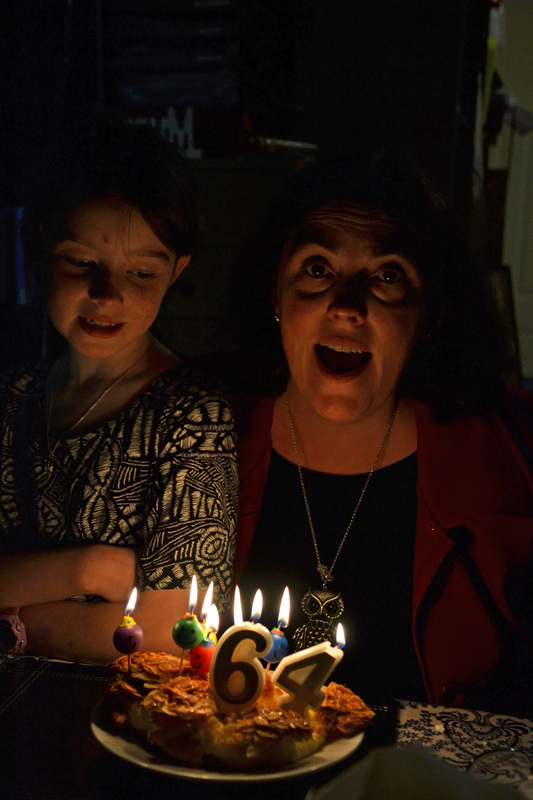 This entry was posted in Parenting and tagged beach, birthdays, cafe, chronic illness, cooking, dogs, family, food, love, Mommy, Mummy, parenting, psychology, walking on July 30, 2015 by Rowena. Being a rather verbose writer who prefers rambling along in free verse and isn’t even good at counting when it comes to playing my violin, let alone at counting syllables, I’d never even considered writing Haiku. That’s the trouble with bthinking “never” because God, serendipity, fate or whatever you call the convergence of forces which plucks you out of your current journey and plants you somewhere else, seems to be conspiring against you. Anyway, tonight we were attending open night at the high school where our son will be attending next year. These open nights are a very impressive, inter-active affair with all sorts of activities for upcoming students and parents. I guess it’s all aimed at bridging that terrifying gap between the relative safety and security of Primary School and the shark-infested waters of high school. Now, even I’m almost convinced everything is going to be okay. That’s a real achievement! Anyway, while Mister was off in the science labs undertaking all sorts of investigates, which I hear included dreaded dissections, I hooked up with the writing teacher who was running a challenge to write Haiku. What a surprise! Although Haiku might be the flavour of the month, I must say that I felt a “call to action”. That this was more than coincidence and it was time for me to cross the bridge and dip my wee little toe into the deep and scary waters of Haiku. I was pleased. Stoked actually because, as I said, counting isn’t my thing and neither is working in syllables or a few words. So, I guess as I face my 46th birthday tomorrow and begin another year, perhaps this is a sign of things to come and I hope that I like that seagull, can keep finding the courage to take flight mid-storm and never give up. This entry was posted in Poetry and tagged birds, education, haiku, healing, meditation, mindfulness, parenting, philosophy, photography, poetry, rainbows, resilience, serendipity, teaching on July 29, 2015 by Rowena. This entry was posted in Uncategorized on July 29, 2015 by Rowena. 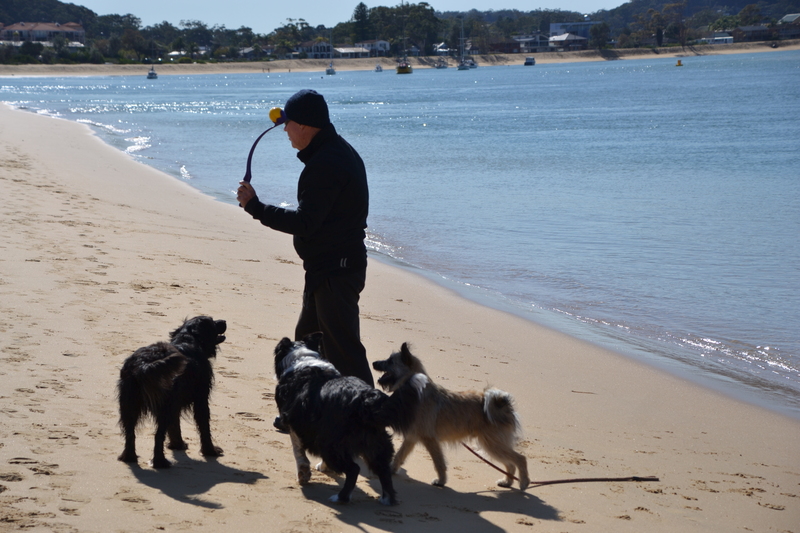 Almost everyday, I take the dogs for a walk at “Dog Beach”. 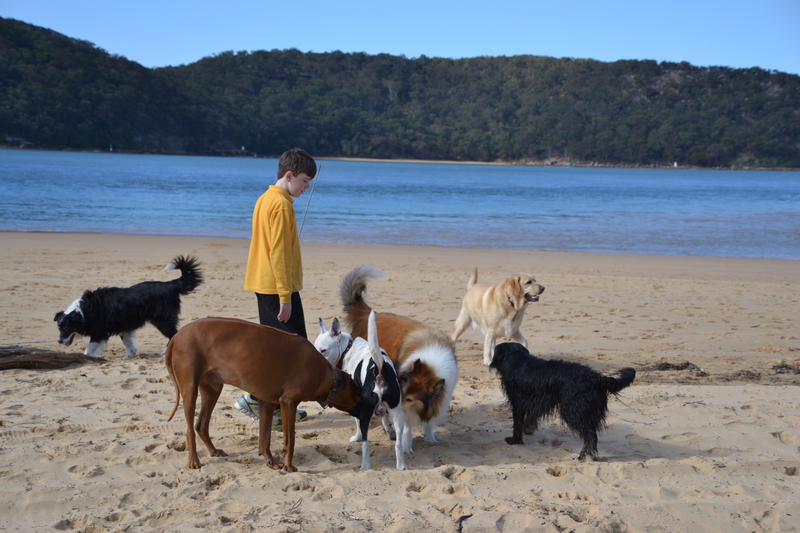 It’s a section of beach between Ocean Beach and Ettalong Beaches where dogs can run off the lead. Not only do the dogs run off the lead but so do the humans. Somehow having a dog breaks down most of those social barriers and we almost all chat to each other and at least know the dogs by name. 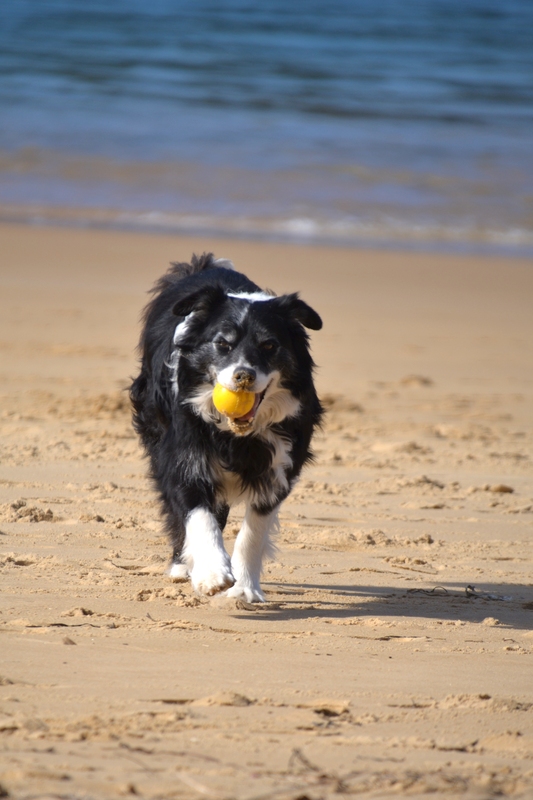 I am quite surprised by the array of dogs which wag their tails, growl, run, chase balls dog along the beach but it’s like Sam the Old English Sheepdog and his mate Hamish, the Lassie Collie really call this stretch of sand home and the rest of us just come and go. They are such character dogs and you don’t see those breeds often in Australia and I’ve never seen them together before so they really stand out. They have such long, adorable coats, that they’re not the sorts of dogs you usually see at the beach either. I used to have a Lassie as a child and we had an Old English Sheepdog before Bilbo. He was a rescue dog and much of the time we had him, I must admit, we felt like we needed to be rescued what with the flying slobber and his food thieving ways. He’d steal food off the kitchen bench and swallow it bag and all. As if that was crazy enough, he’d run round and round in circles during a storm, huffing and puffing like a freaked out canine locomotive. 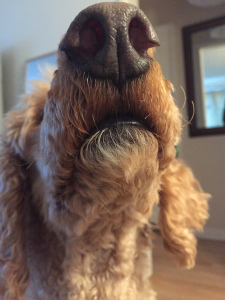 His name was “Loopy” before we got him and although we changed it to a more dignified “Rufus”, it didn’t change the nature of the dog! Anyway, if you’ve been following the misfortunes of the beach since “The Storm”, then you’ll know it took a beating. Trees had been ripped out by the roots and scattered like matchsticks by the violent surf along the beach and the place was looking like a war zone. A vagrant tree branch on the beach after the storms. Well, now it looks like a building site. Part of the beach is blocked off with a row of roadworks cones and there’s a roadworks sign in the middle of the beach and often you can see the bulldozer at work moving mountains of sand to try to save the road. Sandbags have been ordered but this situation is very complex and like any ecosystem, there are things you don’t even consider which are somehow part of the picture and there is so much to consider. 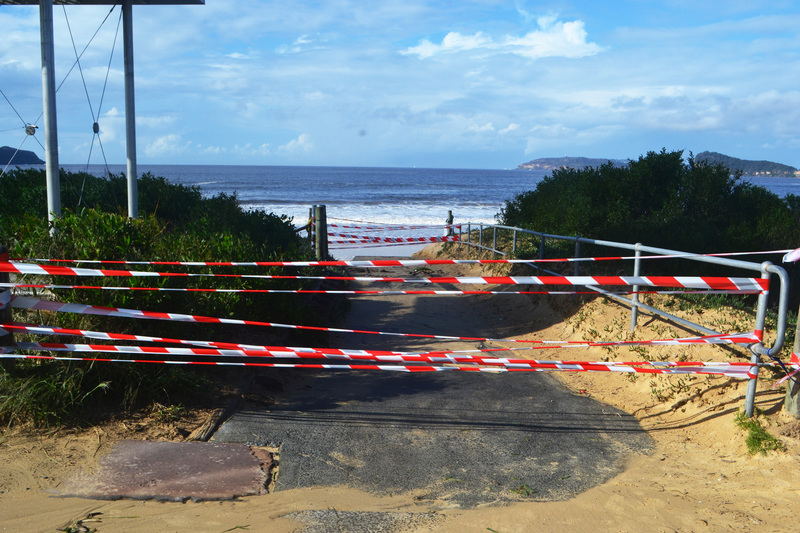 Umina Beach just after the storm in April. That said, you would be surprised how many engineering experts know exactly what to do down at the beach. Everyone has an opinion. No doubt, even the dogs who have turned all the council paraphernalia as yet another “telegraph pole”. Isn’t it funny how the less you know the more certain you are? Sometimes, we joke about our son who is only 11 but still has his opinions: “Often wrong but never in doubt”. His peers are much the same so it’s nothing personal. Yet, how many adults are much the same? After all, it would be reassuring to have those certainties but a complex problem is a complex problem and usually ends up needing a multi-disciplinary approach to take in at least most of the angles. There is definitely no quick fix! 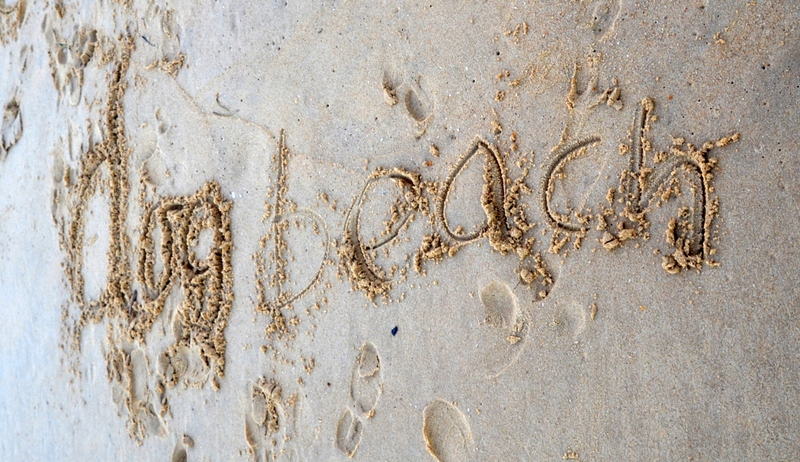 So, in the meantime, our beach hovers in a kind of life support but it is receiving intensive care and a lot of love. We wish it a speedy recovery! 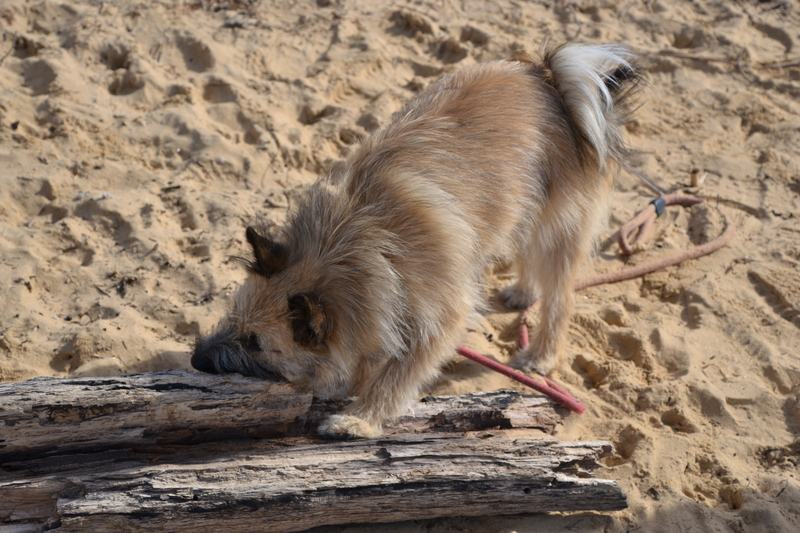 This entry was posted in Uncategorized and tagged adversity, beach, beach rescue, beaches, dog, dog beach, dogs, environment, Ettalong Beach, first aid, Gosford City Council, photography, trucks, Umina Beach on July 28, 2015 by Rowena.